Height 97cm, Width 93cm, weight about 200 Kg. Description: The Garuda is a mythological bird, the traditional mount of Vishnu. Garudas are often represented as part human and part raptor. 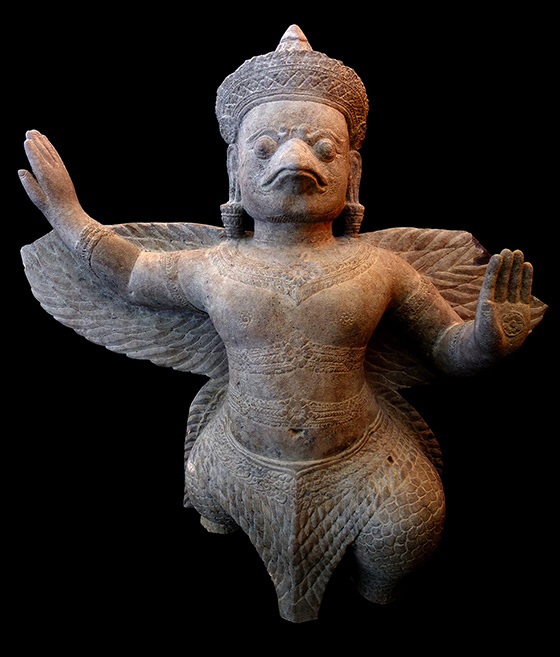 Garuda him self is flying, with his left leg slightly forward, and with knees flexed, make this figure look very powerful. The Garuda is here shown the full proportions, the decorative detail of diadem, and the representation of the ornaments (ear pendants, necklace, belt around torso and abdomen, armbands, bracelets), which are characteristics to the Koh Ker period.